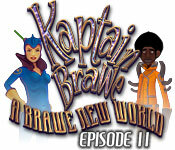 Team up with Kaptain Brawe for a brand new adventure in Episode 2! Journey to space and save the day as a Space Police Officer! Battle wicked Space Pirates and protect the innocent as you journey across the galaxy solving mysteries and completing incredible quests. Dive into this awesome Adventure game and become the hero of a beautiful hand-drawn world! Team up with Kaptain Brawe! Dive into Haunted Manor: Queen of Death and save your sister before it’s too late! Find a powerful amulet to stop an ancient evil!